I took all three children to the craft store the other day (because I am clearly insane), and the twins were firmly belted into the double stroller, but G was all over the place with the “Ooooh, look at this!” and “Mommy, I want this!” while I did my typical pillaging of the remnant bin and browsing through the aisles. 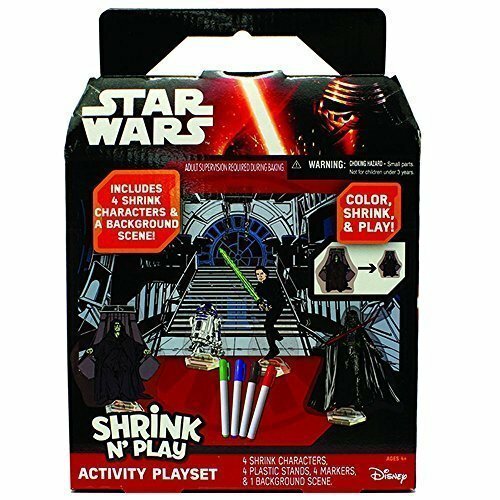 At some point, he picked up this random Star Wars shrinky dink kit and decided that it HAD to come home with us. 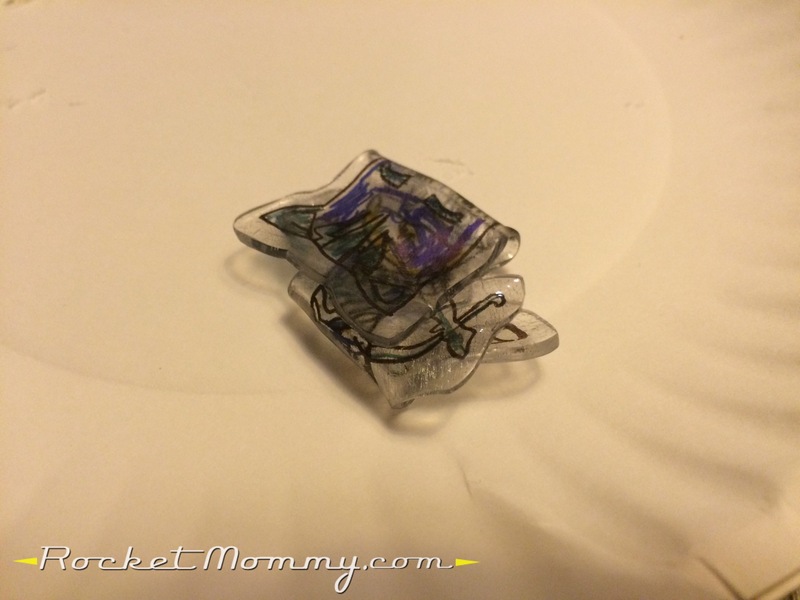 And, well, I had an extra coupon, and he was persistent, so I caved, and we got to play with some shrinky dinks. Well. Fast forward a couple days, and G said that he really, really wanted a Gekko toy. I told him (again) that they still haven’t made any PJ Masks toys, and he said “I know, Mommy, but I think we can MAKE one!” Ha, I’ve created a monster! He started pulling out pipe cleaners and toilet paper tubes, and then I had a way better idea. 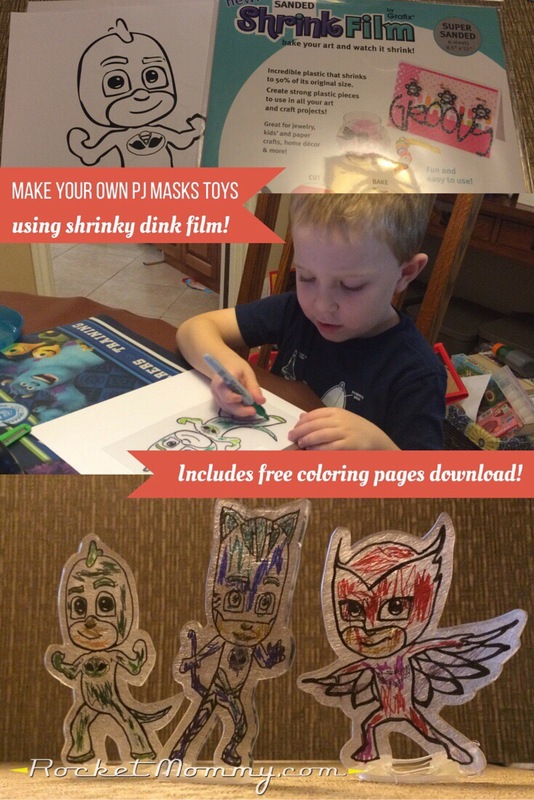 So here we go: let’s give you what you need to make your own PJ Masks shrinky dink toys! First, you’ll need shrink film. 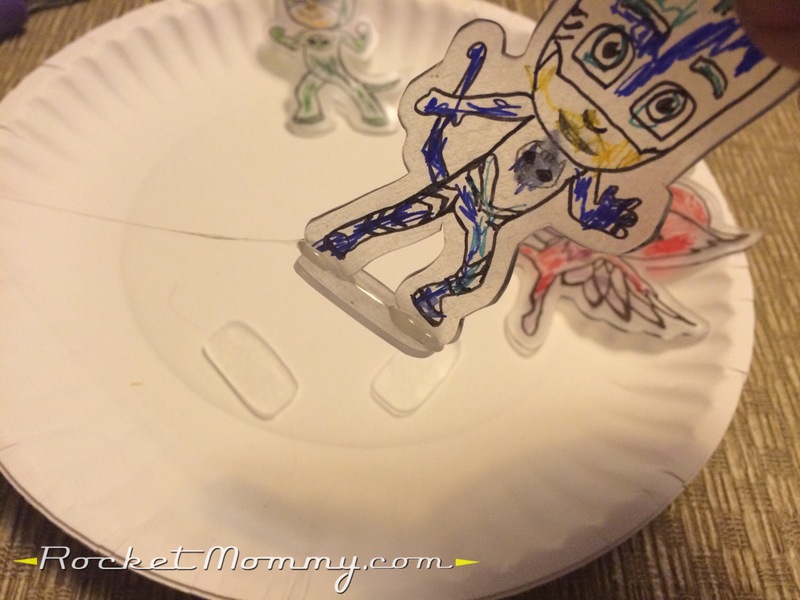 If you google around for DIY shrink art, you’ll find that any #6 plastic will shrink the way shrinky dinks do when it’s heated. HOWEVER, I’ve played around with many different varieties of #6 plastic over the years trying to do other shrink art projects, and it doesn’t flatten out quite as well as the actual shrink film that’s manufactured for this purpose. So do yourself a favor and buy some. 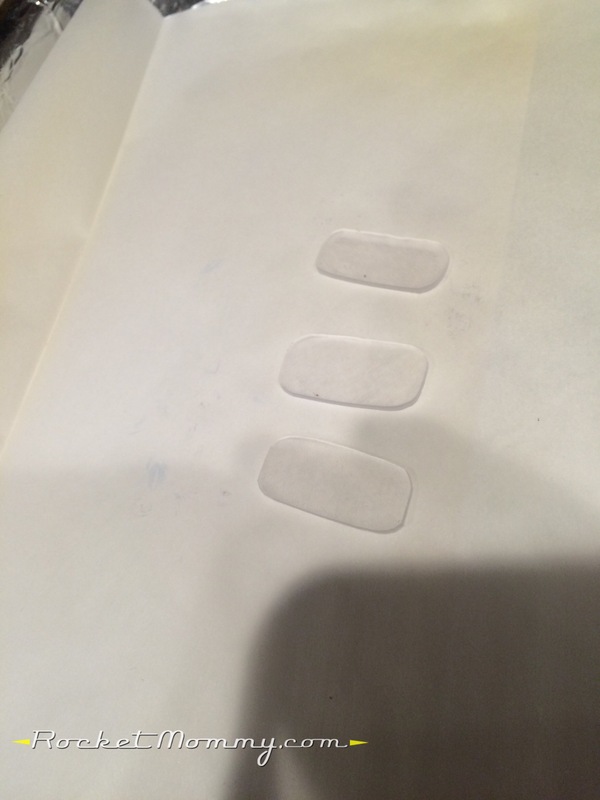 I got this pack of Super Sanded film at Joann’s because it was the only thing they had on the shelf, but there are plenty of other options online – clear, matte, and even inkjet printable. If you have an inkjet printer, the printable film will make this project about a thousand times easier. Sadly, we got rid of our inkjet many years ago, and my parents recently made the switch to a laser printer as well, so I can’t even go mooch off of theirs anymore. But that’s ok, because this is easy enough to do by hand. Gekko and Catboy are sized at 5.5″x8.5″, so two of them can fit side by side on one sheet of shrink film. 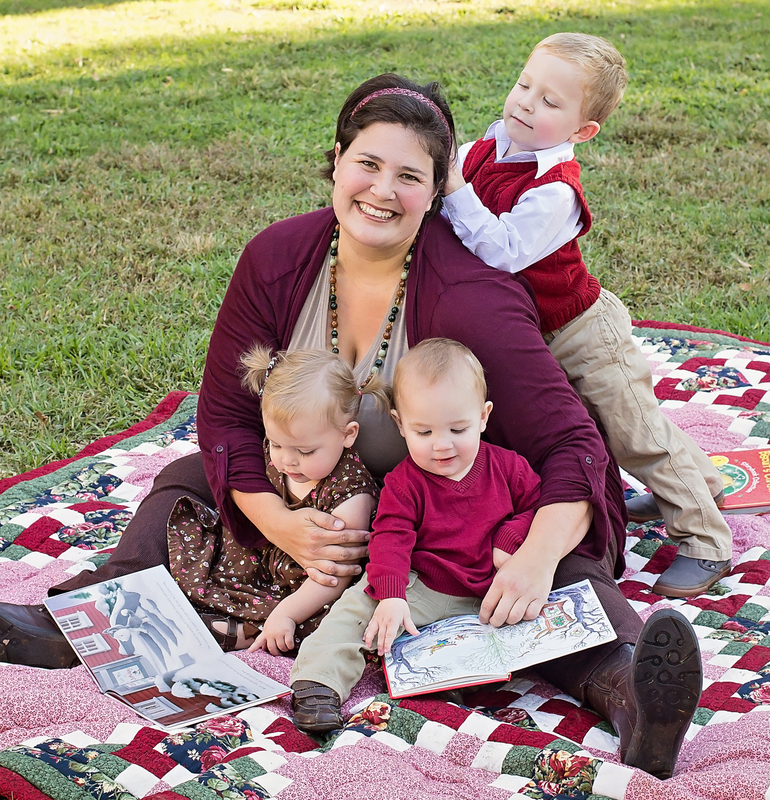 Owlette is 8.5″x8.5″ – her wings were just too wide to fit on a half sheet and keep her the same size as the others. Next step: lay a sheet of shrink film on top of the page that you printed out. 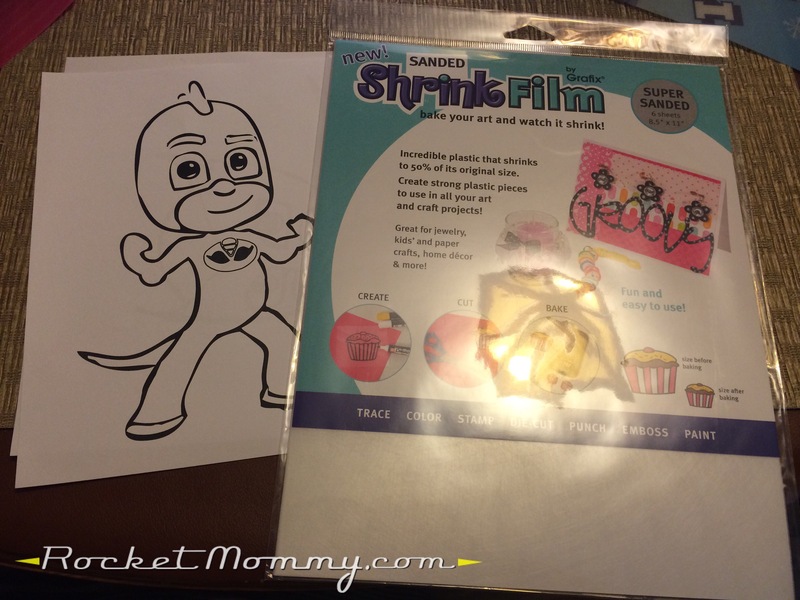 Then go grab yourself a black Sharpie and trace the PJ Masks character on the shrink film. Now it’s ready to hand off to the kiddo for some coloring fun! This was a very rare opportunity for G to get to use “grown up markers,” and he took the responsibility very seriously. 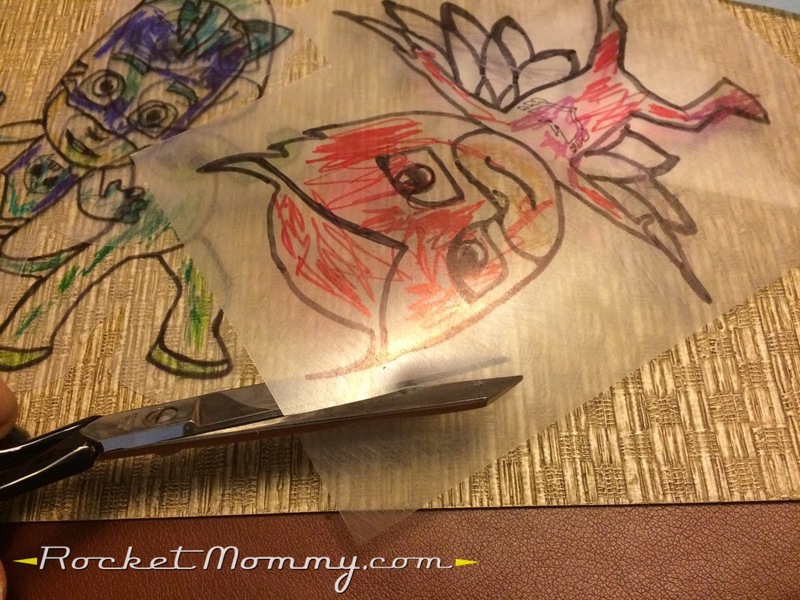 Once that’s done, cut around the edge of the drawing with scissors. I left about a half inch margin around the edge and made sure not to leave any sharp corners, because I’ve learned from previous projects that those little sharp points are deadly once the plastic shrinks down! Now it’s shrinking time! I use our toaster oven for this process, but a regular oven is obviously fine too. 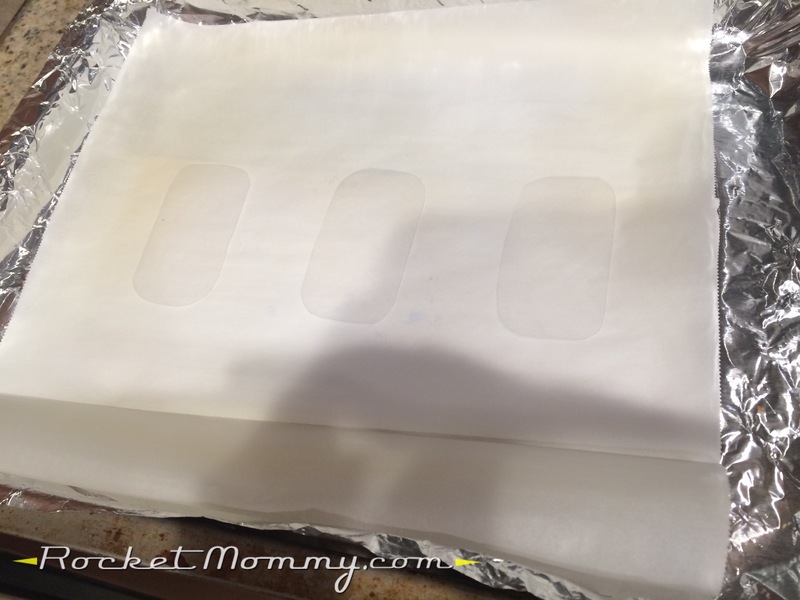 Lay a piece of parchment paper out on a cookie sheet and put your shrinky dink on top of it. Follow the instructions on your package of shrink film for temperature and timing, but mine went in at 350 for about 3 minutes. The plastic curls and warps as it shrinks. If all goes well, it flattens itself back out and you’ll have a nice little plastic figure, like this. If it DOESN’T go well, it will curl up on top of itself and get stuck, and if you’re lucky you’ll be able to stick a couple of skewers in your toaster oven and pry it apart without burning your hands. I don’t know why this happened, but our Catboy figure pulled this stunt TWICE, and the first time it wasn’t salvageable and we had to trace and color all over again. The second time, I saved it, but his head is a wee bit stretched out. The other two worked fine, no issues. Go figure. I cut out three rounded rectangle shapes that seemed large enough to provide a base for the figures. Then I shrunk them down in the trusty little toaster oven too. 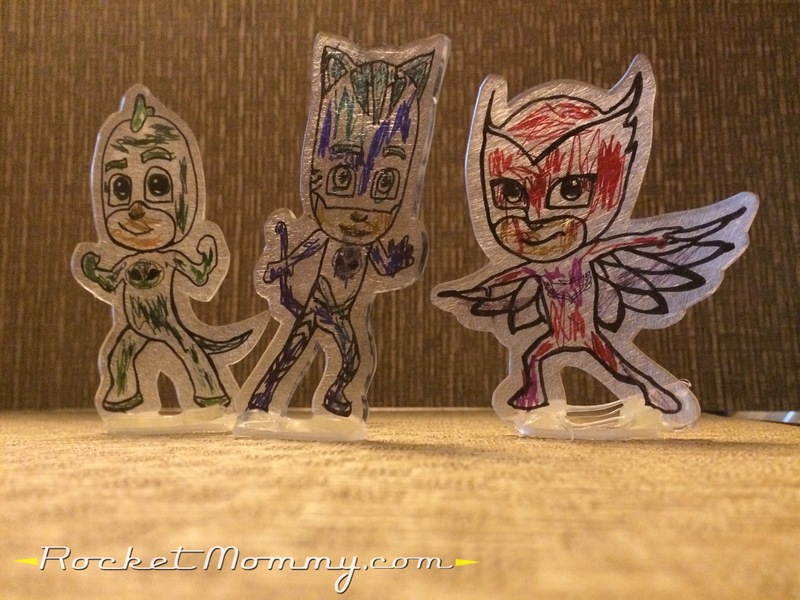 And with a quick little touch with the glue gun, we have PJ Masks toys that can stand up! Oh, and this is a big plus: if you have little kids who can’t yet be trusted with the grown up markers and who are just going to make a scribbly mess on the shrink film characters, those PDF printouts make excellent coloring sheets! So if you’ve got a couple of unruly two year olds who aren’t ready for the responsibility of the “grown up markers,” you can still keep them busy coloring characters after you’ve traced them and they won’t feel left out. 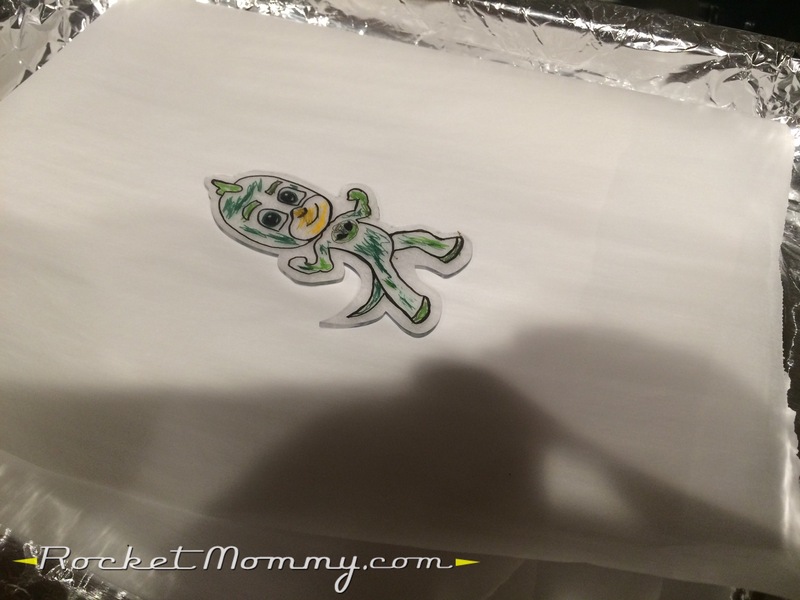 Or you can just print them out if you want a coloring activity for a rainy afternoon or a birthday party and have no interest in the whole shrinky dink process. And they’re free! A little gift from me to you. Enjoy! Thank you SO SO much for providing these! 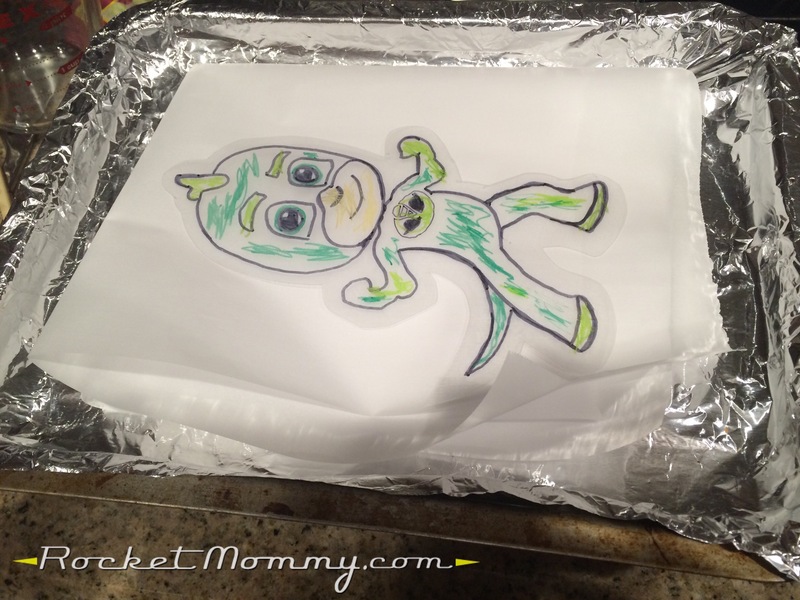 I am desperate for anything PJ Masks for my son’s upcoming birthday party, you’re a lifesaver! Thank you! You’re so welcome! I’m glad I could help! Good luck with the party – I’d love to see how it all comes out! Thank you so much for posting these printables as a mom to two special needs children on the spectrum I am always looking for ways to encourage language anything to engage them in a conversation. God bless you and your family. 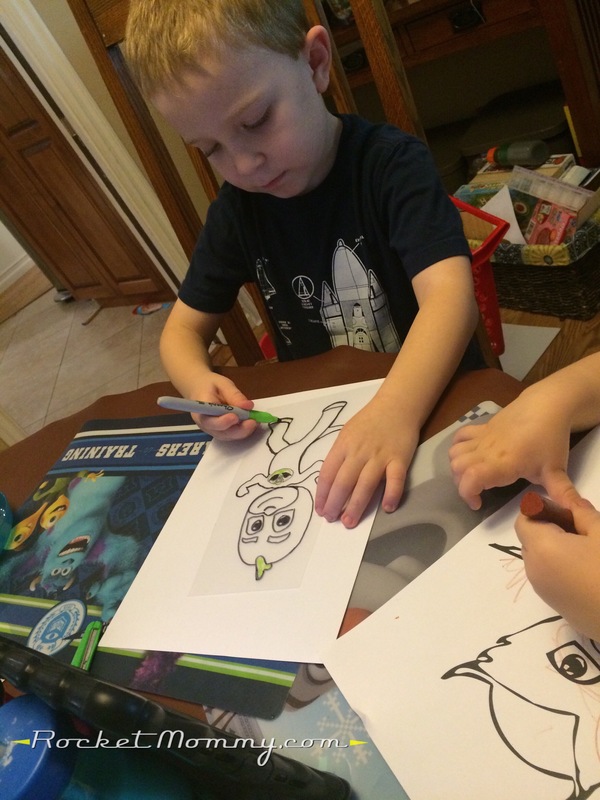 This is our second day coming to print out coloring pages! Thank you so much! My 4 year old sat still to color these then wanted me to put them into a “book”. He has sat around reading this all evening and the first thing he grabbed this morning. THANKYOU! 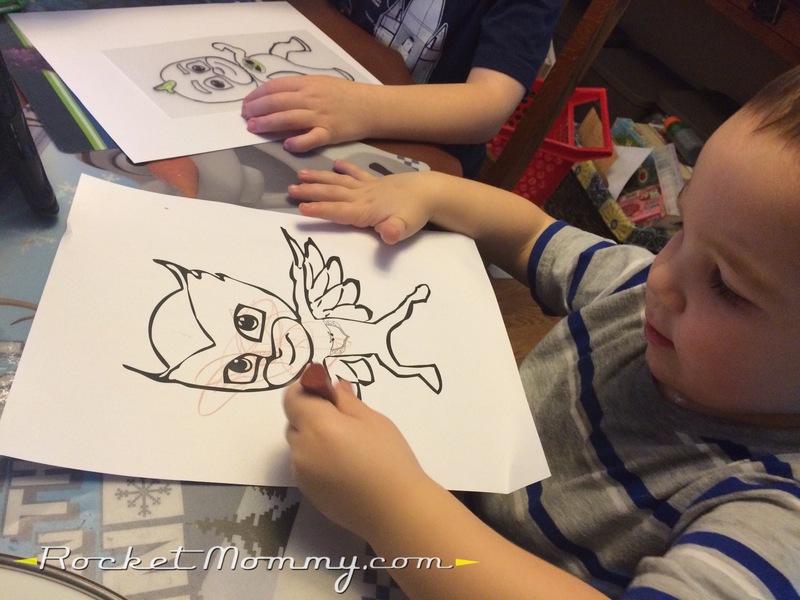 He said Rocket Mommy is a great artist! That’s so awesome! I love that he wanted to make them into a book! Glad they’ve been useful to you :). Thank you for posting these! 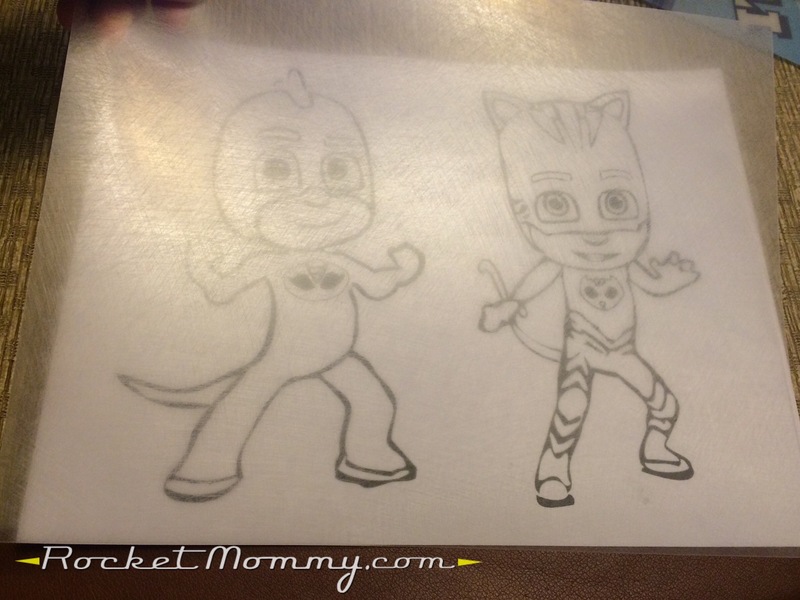 My daughter has been asking and asking for PJ Masks Coloring pages, but I couldn’t find any online. Thanks!! You’re welcome! I’m so glad I could help! Thank you so much for these!!! My son wants a pj masks birthday and I’m refusing to spend money this should be fun. Coloring your printables for hours?!!? 🙂 Thanks again!!!!! Yay, I’m so glad they’ll be of use to you! Good luck with the birthday party! Thank you so much. I will be using these for a Birthday party. 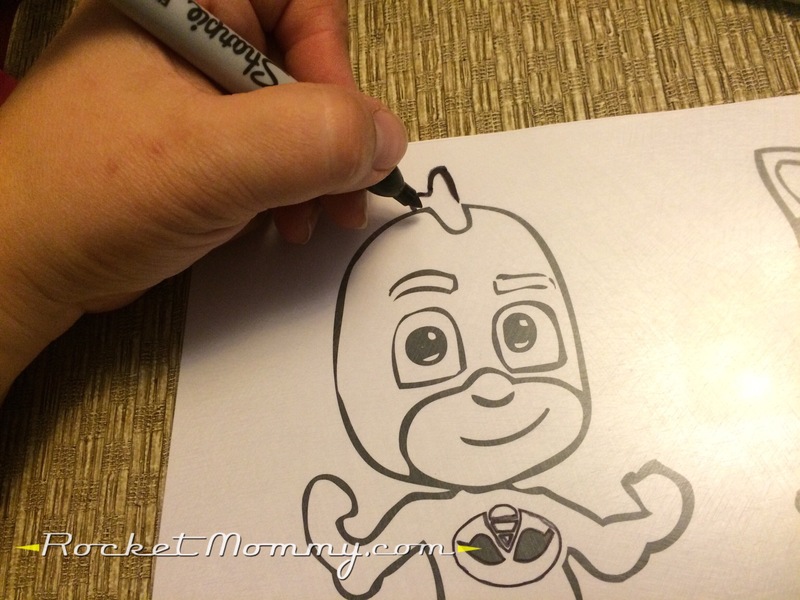 The kids are going to love coloring the PJ Masks!